The present e-book series edited and managed by professor Rezitis, offers new challenges and opportunities to economists and agricultural economists since it delivers advance empirical work to a broader audience of both economists and agricultural economists. In this book, a perfect job of connecting pure economic methods to current agricultural applications has been achieved. Thus, this forum will constitute the main background for further development of such kind of agricultural research. In this particular volume, high quality of empirical studies covering areas like price transmission-agricultural policies-convergence-investments-cooperatives-gas markets can be found. Moreover, authors that joined this volume have a great deal of work on the area they contribute and they can be contacted for any further published literature. 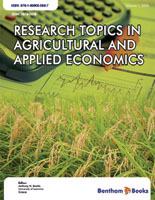 The aim of the e-book series of Research Topics in Agricultural & Applied Economics (RTAAE) is to publish high quality economic research applied to both the agricultural and non-agricultural sectors of the economy. The subject areas of this e-book series include, among others, supply and demand analysis, technical change and productivity, industrial organization, labor economics, growth and development, environmental economics, marketing, business economics and finance. By covering a broad variety of economic research topics, this e-book series is addressed to a wide spectrum of academic agricultural and applied economic researchers and scientists but it could also prove useful to industry specialists and government policymakers. Chapter 1, entitled “Price Transmission and Markov Switching Regime Shifts: An Application to the Greek Lamb Market”, examines the long-run price relationships and regime shifts that govern the price transmission mechanism between the farm, wholesale, imported and retail levels of the lamb market. Chapter 2, entitled “Evaluating Economic Incentives for Greek Organic Agriculture: A Real Option Approach”, applies option-pricing theory to evaluate investment decisions by farmers regarding their potential conversion to organic agriculture. Chapter 3, entitled “Ex Post Evaluation of Mathematical Programming Models in Predicting Arable Farming Reactions in the Decoupling Era”, presents an ex post validation of the standard linear programming, non-linear programming and two alternative positive mathematical programming model specifications by comparing the performance with observed data of the new CAP implementation in Greece. Chapter 4, entitled “A Comparative Financial Assessment Analysis of Agricultural Producing Cooperatives in the Krasnodar Region – Russia”, examines the organizational functions and economic status of agricultural cooperatives in Russia, providing a perspective of the current dynamics of the cooperatives with respect to recent changes in the Russian agricultural sector. Chapter 5, entitled “The Evolution of Solutions to the Free Rider Problem in US Agricultural Bargaining Cooperatives”, addresses the issue of how intra-organizational incentive alignment mechanisms evolve to solve the free rider problem in collective bargaining and focuses on agricultural bargaining cooperatives (ABCs), a particular form of producer-owned firms mainly observed in the West Coast states of the US. Chapter 6, entitled “Performance Measurement in the Greek Context: Evidence from Different Corporate Settings”, investigates the impact of performance measurement systems adoption on firm profitability by matching a group of manufacturing industries with peer firms that were not manufacturing industries. Chapter 7, entitled “Nutritional Label Users’ Ability to Perform Nutrition Tasks as a Dietary Consumption Constraint”, uses a simultaneous equation model to investigate how the ability to perform nutrition-related tasks, among nutrition label users, may affect diet quality. Chapter 8, entitled “Spatial Approach to Territorial Convergence Across the EU-15 Regions and the CAP”, examines the role of spatial dependence and heterogeneity on real agricultural and economic convergence across a sample of 166 EU-15 regions. Chapter 9, entitled “Human Capital Convergence in Greece: A Panel Data Analysis”, examines the existence of human capital convergence between Greek regions. Chapter 10, entitled “Economic Determinants of Inward Foreign Direct Investments to Transition Countries: The Cases of Bulgaria and Romania”, attempts to assess the main foreign direct investment (FDI) determinants for Bulgaria and Romania, after their accession to the EU. Chapter 11, entitled “Liberalisation of the European Natural Gas Market: Myth or Reality? Evidence from Greece”, analyses the main aspects involved in the liberalization process of the EU natural gas industry and the extent to which it has impacted on less liberalized countries such as Greece.